I mentioned a navajo backpack is my mission for this spring but there hasn't been one that has caught my eye. 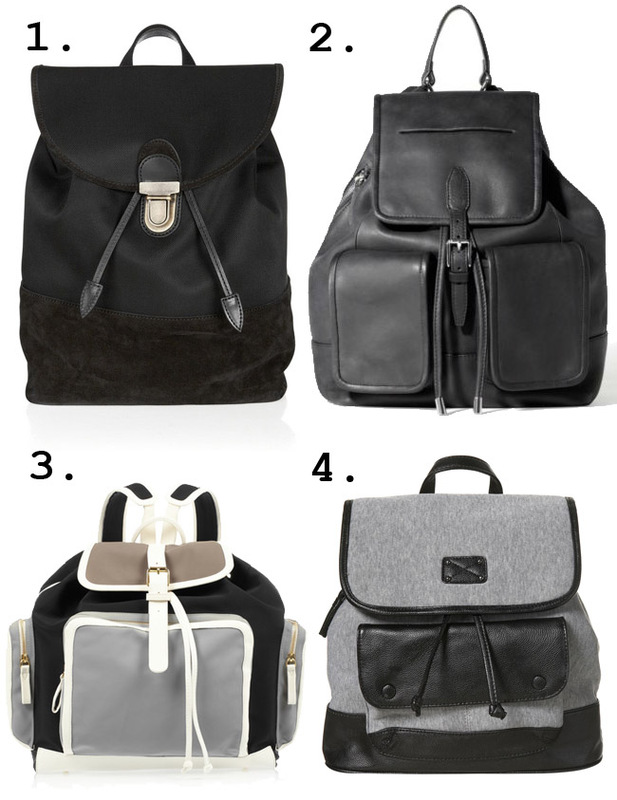 However, a simple mutedly toned backpack iss equally a priority on my wish-list. Here's a few which have caught my eye and I'm currently doing a pros and cons list in my head! 1. Acne Morab Nylon and Suede Backpack, $700, available at Acne. 2. Theyskens Theory Backpack, $575, available at Theory. 3. Pierre Hardy Contrast Neoprene Backpack, $1,650, available at Net-a-Porter. 4. Topshop Gray Jersey Backpack, $50, available at Topshop. I would go with the first one. A timeless beauty! Take Nr 1 or Nr 4, they are the most beautiful of all *__* !!! oh sheesh, the Acne one is unreal!! I love the mix of textures, it's so subtly complex. I love it!! great style!